Required Window Media Player 9 + Click here to download. he is most welcome to hong kong. Deepak ! welcome to Hong Kong. Thank you organizer to making this possible…..Nepal Tara will be here with us…..really eager to see him. it is the way for me to meet to Star Deepak. Congratulation and welcome to Hong Kong. I will see you again 4 Dec. 2005 at kowloong park hk. good luck. Why only nepal tara ? why not other second one? Cyber cafe ma line lagayera ? cyber cafe book garayera ? eakjana le…10 hajar vote nai khashale pachhi ko nepal tara ? final ma pugeka dubai nepal ka tara hun ? ??? malai voteing system man parena next year bichar hos ? hoina sharukh khan ko dreamz unlimited hong kong ma pani chha? achamma bho ? Ke ko achhama suwani? suwani bhanne timi matrai chhau ra? and unless there is no copy rights needed every one has right to keep the name if they wish………..so any problem? And, Please be noted this has been registered in Hong Kong since last 2 years for as Media & Event Coordinator and already coordinate numbers of program such as “Talent - Hunt 2005′’. Your comments are welcome anyway! By the way, Shahrukh Khan ko Company is no longer called dreamz unlimited hai it has been changed another name called red chilli for your kind information. Congratulation and welcome to Hong Kong. best of luck again again broo. maile ta Nepal ma chai dreamz unlimited bhanne event management team dekheko thiye….Hk pani rahecha !! r u guys same ??? 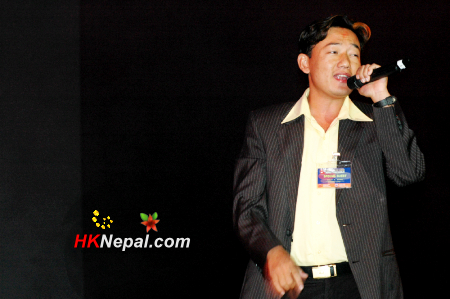 It’s really nice to see Dipak Limbu Nepali Tara here in Hong Kong and thanks to HKNepal.com for his vedio clips. after watching his video clips, I guessed he will be a good singer in Nepal within next 4/5 years. “Kaag lae bel paakyo Harsha na Bismat” Kahan tyo HK and Kahan yo ma basne SOMALIA. Whateva, i still could enjoy with vdo clip.Thanks hknepal team & jaya hosh paravo.suuu let me dropp into..
tapaiko vocal yekdam ramro lageo. Hi Deepk , welcome to hongkong than congartulstion. hi deepak limbu thanks for nepali tara and wel come in hong kong program.then succes ur golden life. I really appreciate ur job keep it up u r the one hopefull star of Nepal.